Hay Hay It’s Donna Day #9 – The Roundup! Don’t Forget To Vote – Hay Hay It’s Donna Day! Weekend Cookbook Challenge is a monthly blog event, normally hosted by Sara at I Like To Cook, that I used to take part in quite regularly. Each month has a theme for which recipes are submitted. When I saw what the first WCC for the new year was, I realized it was a sign that I needed to resume taking part: use a new cookbook for your blog entry. Folks…I received EIGHT new cookbooks over the holidays as gifts. A good way to put them to use, don’t you think? One of the more interesting cookbooks I received was Bountiful Wisconsin, given to me by my friend Mike who lives there. Its a compilation of award winning recipes throughout the state, most of which use locally influenced produce and goods. Since I’m still fixated on "oh-how-i-wish-it-weren’t-30-degrees" cooking, the recipe for this pasta salad jumped out at me. I often hesitate to follow pasta salad recipes because many of them get globbed down with heavy dressings and seasonings. This recipe is great for several reasons. First, the flavors are very fresh and not artificial tasting – no scary bottled Italian dressing here. Secondly, it’s very easily adaptable to whatever you have on hand. I added some green onions I had in the fridge for a little more color and flavor. Lastly, I loved the notion of the crisp green beans in the salad – it’s a great crunchy addition to the salad! 3/4 pound penne or ziti – i used Dreamfield’s low carb penne in this batch. – Cook pasta in lots of boiling, salted water. 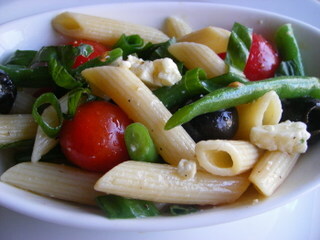 When pasta is about three-fourths done, add the green beans and continue boiling until pasta is tender. Drain well. Toss pasta with remaining ingredients and serve immediately. Recipe originally publishes in Bountiful Wisconsin by Terese Allen. Photo by Tami Hardeman. Yummy! And Hooray for Dreamfield’s pasta. Saving this to del.icio.us right now. The ingredients in this pasta are wonderful – I love them all! Lovely photo. This looks delish. Excellent. Only had spagetti so we used that. Has anyone tried it with another kind of cheese?